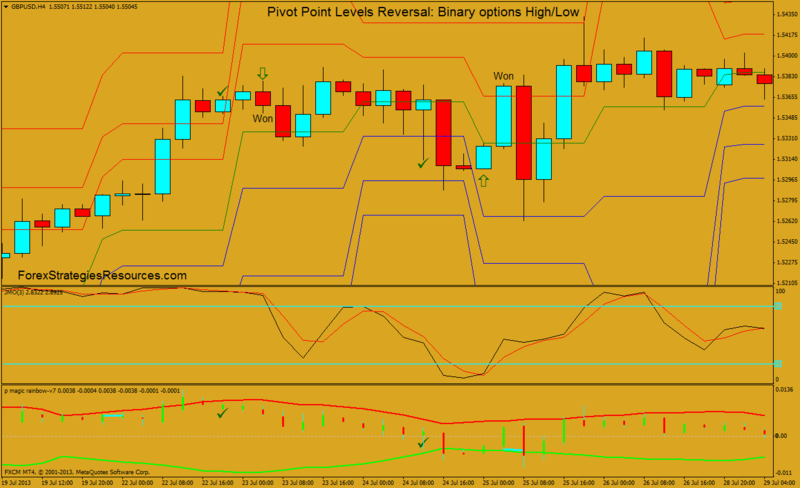 This Strategy Binary Options is based on the metatrader indicators: JMO and Pivot Points Levels but is inspired at 1hr trading system Levels Reversal but i have add a new indicator for filter(P.magic rainbow v.7). Time Frame 240 minutes: Exiperes time 240 min or 480 depends by depends on the risk that one is willing to accept. 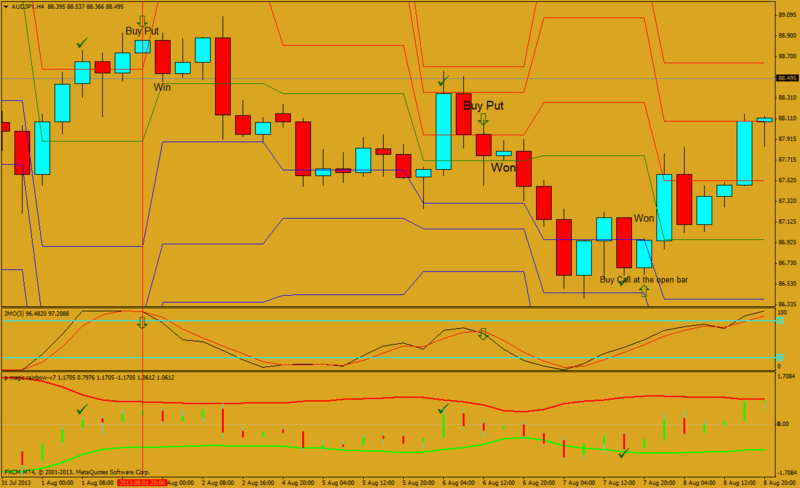 Markets: Forex, Stocks, CFD, Futurex, Gold, Silver and Oil. P-magic Rainbow .v.7 (for filter). When that the price breaks a support Pivot Point level, wait that jmo indicator come back up from overbought area and crosses upward. This condition is reliable if P-Magic Rainbow does not break the upper band. P-Rainbow Magic should fluctuate within the bands. When that the price breaks a resistant Pivot point level, wait that jmo indicator come back down from oversold area and crosses downward. This condition is reliable if P-Magic Rainbow does not break the Lower band. The Trading Rules are the same. 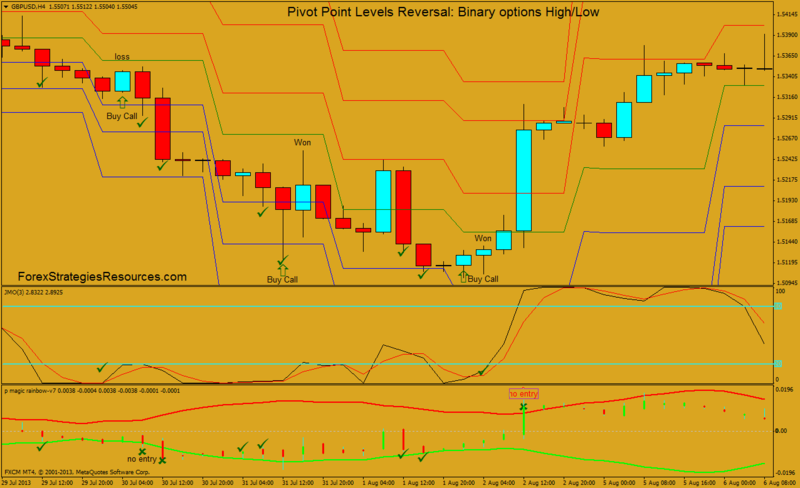 Share your opinion, can help everyone to understand the Binary Options Strategy: Pivot Point Levels Reversal. 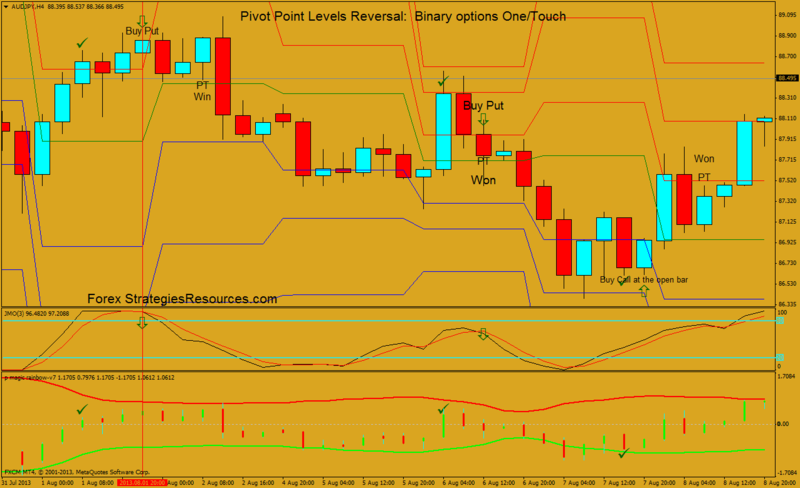 Pivot Point Levels Reversal: Binary options One/Touch.